Do you think blogging 3 times a week is too much? 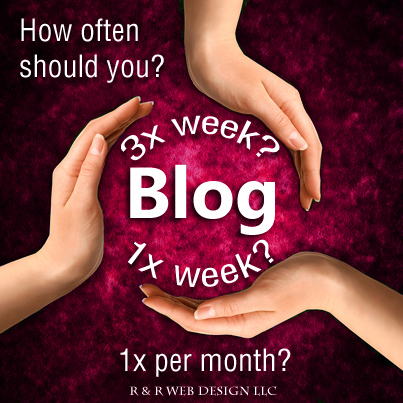 Do you want a blog, but cannot blog more than once a week? I am excited to share with you that there is a way to have a successful blog without posting 3-5 times a week. Recently, we have been looking into the amount of articles a blog writer should be posting. The Golden Rule is 3-5 times a week or 16-20 times a month. I stand by that golden rule. In all of the blogs I write for, I follow that Golden Rule. However, I also know how daunting of a number that is, and I also know the last thing we want to do is overwhelm our followers with posts. One way to prevent your followers from ignoring your posts is to create great content. In 3 Ways to Make Your Blog Content Great, I shared with you ways to have great content. But, I became interested, is there a way to post less often and maintain a blog presence? This week I did some research and found out I was not the only writer looking to maintain their blog presence while posting less. I stumbled across a podcast on Social Media Examiner. Michael Steizner interviewed Derek Halpern of Social Triggers. Now, there was a lot of great information in this podcast, but what was most interesting is that Derek said that he only posts on his blog about 2.7 times a month. Derek took his site Social Triggers from a new site to “tens of thousands of subscribers”. Derek shares further that the goal of his site is to get his readers to implement his advice in order to create lifelong readers. He also admits that if he posted more, he would get more traffic to his site. However, because he wants people to implement his recommendations, he does not overwhelm his subscriber’s in-boxes with tons of content. So the question becomes what is the goal of your blog? Do you want lots of traffic so that your products can be seen by many, many people? Are you trying to create a following of “lifelong readers”? I believe that you never have to sacrifice great content even if you want to post articles 5 times a week. Next Monday, I will be sharing some ways to make your blog articles easy-to-read. What do you think? Are you willing to sacrifice site traffic? It totally depends upon the goal of your blog. Do you want it to be on SERPs or are you just blogging for fun. Emily, Thanks for commenting. I agree, it is all about the goal of your blog.